Mary King, (nee McKeown), 93, passed away on Saturday, August 11, 2018 at her home in Kearny, NJ. The funeral will be from the Thiele-Reid Family Funeral Home, 585 Belgrove Drive, Kearny on Thursday, August 16, 2018 at 9:00 a.m. A Funeral Mass will be offered in St. Stephen’s Church, Kearny at 10:00 a.m. Entombment will follow at Holy Cross Cemetery, North Arlington, NJ. Relatives and friends are invited to visit at the funeral home on Wednesday from 4 to 8 p.m.
Born in Kearny, Mrs. King was a lifelong resident. She was a proud member of the St. Cecilia Seniors and the St. Stephen’s Seniors both of Kearny. 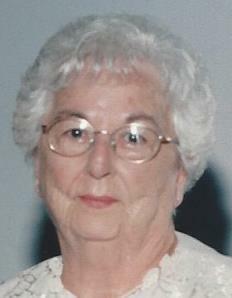 Mary is survived by her children, Eileen Walker, Mary Ellen Cvek (Peter), Janet Moran (Jack), Judith Kommer (Michael) and Kearny Police Chief, George King (Ruth); nine grandchildren, Heather Warren, Patrick Walker, Jack and James Moran, Michael and Brian Kommer and George, Sean and William King and three great-grandchildren, Caelin and Landon Warren and Liam Walker. She was predeceased by her husband, George King and her son-in-law, Mark Walker.